I've created a path with a stroke and a fill of the same color, and I'd like to remove the stroke while preserving the size/shape of the object. Is there a simple way to do this? In other words, I'm looking for something like a "Stroke-and-Fill to Path"
The best solution that I have come up with so far is to use "Stroke To Path" and then delete all of the inner nodes. Convert selected object's stroke to paths (Ctrl + Alt + C). Break apart the path (Ctrl + Shift + K). Delete the inside path by clicking somewhere outside, then clicking in the center and deleting. Yep. That's how you do it. That will save you the step of having to delete the inner nodes. Not the most elegant solution, but if you don't need too much precision you can just take the path with stroke and click in it with the paint bucket tool (you may set a little bigger stroke on the path). I sometimes use this stupid trick with letters or logos, becouse the union-method explained above often leaves nodes and imperfections in the final path. Still in need for a specific tool (it would be useful). select erasing existing paths tool and aply it just on the border you want to remove. 1) select the object by "edit paths by nodes (F2)". it is 2nd item on left. Now you won't have white borders when you color the object. 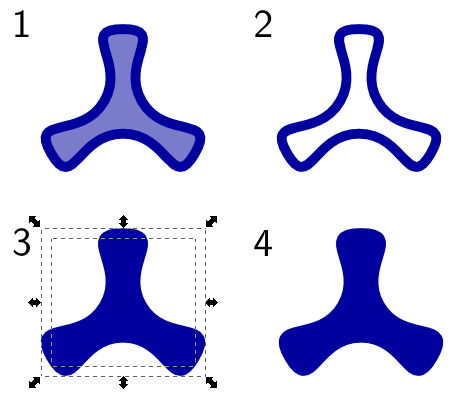 In Inkscape, what's to quickest way to combine an object's stroke and fill to an unstroked object?